Three independent, intelligent, innovative and gorgeous blondes are setting out to change the way the world sees Baja. Robin Leigh Mackenzie, Susanne Stehr and Debbie Shine have filmed and produced a pilot episode of a new kind of reality TV show called Baja Blondes. The 15-minute pilot was derived from eight hours of footage, which includes interviews with all three women, along with shots and highlights of the beautiful area they love to live and work in and wish to paint in a positive light. 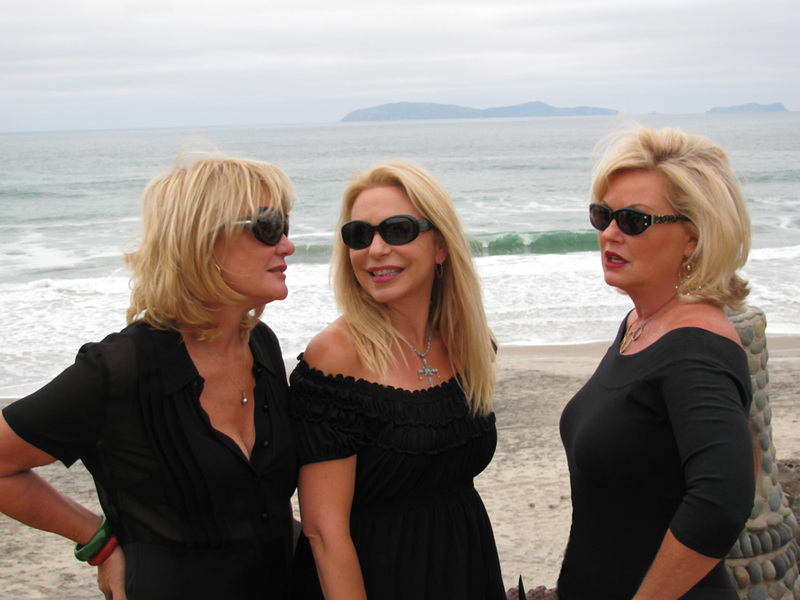 The concept for the show came about as Susanne and Debbie watched the media and other outlets put forth a negative view of life in the Baja area. With the constant bombardment of drug cartel crime stories coupled with a U.S. State Department travel alert for the area, tourism and business has dropped considerably for the Baja region. According to Mackenzie, over 300 businesses have gone under primarily due to the decline of tourism. The collapse of the economy and housing market in the U.S., especially the secondary housing market, also contributed to the decline of tourism and business in Baja. Instead of idly standing by and riding out the rough economic seas, Susanne and Debbie teamed up with San Diego producer Robin Leigh Mackenzie to present a more positive view of life and work in Baja. The show depicts these three as successful American women who are thriving and surviving just fine in the picturesque backdrop of Baja, and having fun in the process. These three have come together from varying backgrounds. All three are successful American women who bring amazing life experiences to the table to make the show that much more unique and enticing. Robin Leigh Mackenzie grew up anywhere and everywhere. As a military brat whose father was in the Air Force, she traveled extensively and attended four different high schools in the process. After a whirl wind journey of going to the University of Kentucky, flunking out, marrying, having two kids, divorcing and ending up a single mom, Mackenzie went back to school when her children set off for college. She attended UCLA and discovered her true calling of screenwriting. She founded the Women in Film San Diego and has produced a women filmmakers’ series for the San Diego Film Festival. Other professional credits include producing and writing Mothers and Daughters and a reality cooking show called Gourmet for a Day, along with numerous plays. She is the founder and producer of Tatblue Productions, which is behind Baja Blondes. Susanne Stehr is a California-born-and-bred beach girl and UCLA alum who has worked for many high-end and exclusive Southern California resorts and hotels. She handled over 500 weddings during this time in her life. After moving south and working in the military aircraft parts industry with her husband, Susanne opened a small and successful furniture store at Pueblo Plaza. She currently owns one of the most successful restaurants in Rosarito Beach where you can get the best wines Baja has to offer. Susanna’s restaurant has hosted hordes of tourist, athletes, actors, politicians and artists. Debbie Shine is originally a New Jersey girl who ended up following a musician boyfriend to Berkeley in the '60s. This led to a stint designing costumes for his band, then on to traveling with the Pointer Sisters and the Go-Go’s. She made her way to Rosarito Beach and worked with James Cameron on Ghost of the Abyss. She also opened a small boutique in Rosarito and has spent the last several years doing interior design for others who make the move across the border. The pilot episode of Baja Blondes is complete and gaining the attention of industry insiders. It is currently being shopped around to media outlets; and they also hope to team up with the Mexican Tourism Board to utilize the show as a new approach to advertising tourism in the area. Mackenzie says, “It is outside of the box advertising. We are Americans. We can talk to the American tourist. We are trying to change the thinking of old-school advertising.” Rather than just making Baja a dream destination of the typical tourist the MTB has been targeting for years, the Baja Blondes hope other successful American business women will see Baja as a safe and beautiful place to live and work. Other outlets the Baja Blondes are pursuing for the reality show include The Travel Channel, Lifetime and, potentially, the Oxygen network. The LA Secretary of Tourism also believes the idea and concept of Baja Blondes can work to increase tourism in Baja, according to Mackenzie. Aside from revamping how living and working in Baja is seen by outsiders and increasing awareness of opportunity and success in the area, these women are also showing a different view of how women are portrayed on reality television shows in general. They are not your typical fame seeking young girls who are willing to throw each other to the wolves for airtime. They are professional, intelligent and accomplished mature women who support and root for other successful women. If more episodes of Baja Blondes are ordered by media outlets or the MTB, the show will focus on other American women who live and work in Baja. To prove just how much buzz the show is generating, Baja Blondes were awarded a Rosarito City Recognition Award by Mayor Torres and the city council for their promotion of a positive image of Baja. More information on the reality series Baja Blondes can be found at www.thebajablondes.com.